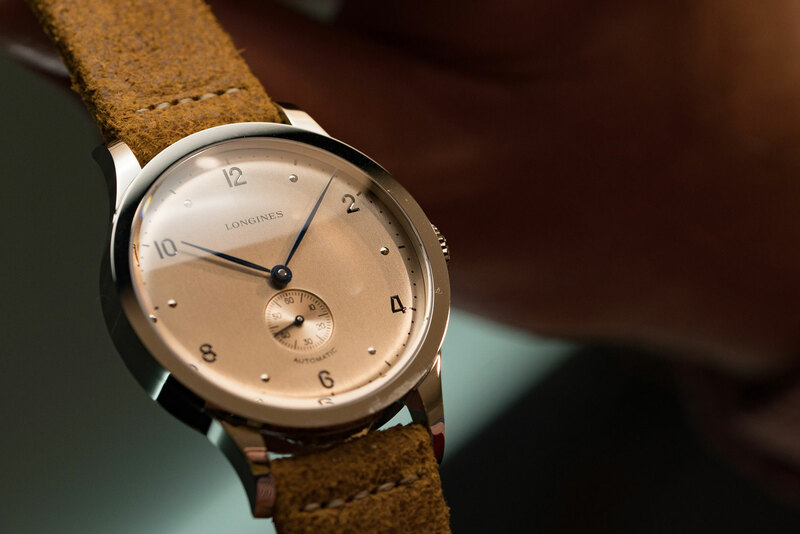 It’s Longines’ 185th anniversary this year, as you might have seen so it’s no surprise that the key heritage pieces were very strong at Baselworld. As we’d hoped, the new Lindbergh Hour Angle model – which I developed strong feelings for after a visit to the Longines headquarters in Saint Imier earlier this year – did drop early, ahead of the 90th Anniversary of the pioneering aviator’s famous New York to Paris crossing. If the watch was somewhat expected, the style was not; it has has a surprisingly contemporary feel. Hello there black PVD bezel, for example. And the Longines Heritage 1945, well that gave us a serious case of de ja vu back to 2015, when the supremely talented artist Sunflowerman painted an almost identical model for the Longines Watercolour Watch Project. The king move, though, was Longines launching their first range to be fully COSC-certified, the Record collection. It’s an extremely accessible range in terms of price that may answer prayers for those wanting a time and date chronometer without the usual cost, but it may also serve to raise questions about why rival brands charge such a premium for a certification when Longines has managed to have prices from $2250 for ladies versions and $2750 for men’s models.